Bi-metal bandsaw blades, as their name suggests, are saw blades that are made of two metals that are welded together. One method of creating this type of blade is known as electron beam welding (EBW), which is a fusion welding process in which a beam of high-velocity electrons is applied to two materials to be joined together. The electron energy heats up on impact, melting the materials. Another method for creating bi-metal blades is with laser beam welding (LBW), a technique used to join multiple pieces of metal using a laser. EBW and LBW both help in creating high-speed steels: alloys that gain their properties from tungsten, molybdenum, or both. They are Fe–C–X multi-component alloys (X being chromium, tungsten, molybdenum, vanadium, or cobalt). The alloying element percentage requires appropriate high-temperature heat treatment to become true high-speed steel (HSS). This HSS is joined in creating the bandsaw blade teeth, which in turn offers a high-strength carbon steel base. Because of the two types of welding process, the blade teeth are able to last longer and will easily cut through harder materials with better accuracy. Spring steel is often used for backing while the most common type of HSS is utilized in edging. Bi-metal blades are the go-to blade for cutting a variety of materials and because of their multi-material cutting capabilities. They also allow for faster cutting rates because of their high heat, abrasion, and shock resistance. 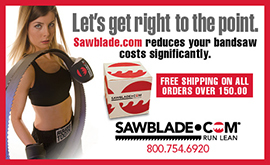 SawBlade.com recommends the use of an M42 bi-metal blade. The M42 is a high-speed steel alloy bandsaw blade that is widely used in metal manufacturing. The M42’s teeth are made of alloyed HSS using 8% cobalt and 10% molybdenum. The M42 can withstand heat and shock better than other blades. It will work to increase cutting accuracy while also speeding up cutting time. This is a blade for use when precision, time, and accuracy are desired and down-time due to breakage or blade jamb need to be avoided. This entry was posted in All Posts and tagged #bandsaws, @RunLean, Bi-Metal, high-speed steel, M42, machinists, sawblade.com, woodworkers. Bookmark the permalink.